What exactly is the BARF Diet? How to transition towards a Raw Dog Food Diet? Alas, more and more dog owners put the responsibility of feeding their dogs in the hands of corporate animal-feed manufacturers. And the reasons are simple to fathom: it’s easy, clean and it’s just what everybody else does. People trust their manufacturers, their vets, and their breeders. These days the number of diseases are increasing dramatically. Cancer, allergies, pancreatitis, skin problems and many other diseases are very uncommon in dogs. It’s proven that a big part of these increasing health issues is food related. And this is where the BARF diet has a role to play. BARF, or Biologically Appropriate Raw Food, imitates the diet of a wild dog, a wolf, and other carnivores. The whole diet is fed raw (as wolves didn’t have hob and pan to cook their rice in!) As well as prey, the wolf also eats fruit, herbs, berries, grasses, roots, insects, and also the insides of herbivores. Mostly, however, the wolf eats whole animals. Every part of an animal will be eaten except the larger bones, a large part of the skin and coat and a portion of the gastrointestinal contents. A paleo diet or prey diet would be a suitable BARF type of diet. A wolf gets all the vital nutrients like protein, fat, minerals, vitamins, enzymes and fiber by eating a whole animal. 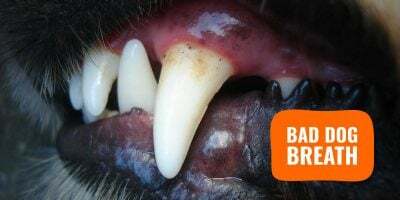 By biting through flesh and bone the teeth of a carnivore will be strong and clean. This also actually prevents their breath from smelling bad. Dry food, on the other hand, contains such things as “animal by-products”, “poultry meal”, “dry-snip”, “fish meal” or “bone meal” and so on. The list, unfortunately, is very long. The chemicals, preservatives and flavor enhancers are all factors which allegedly increase illnesses. Apart from these very unnecessary and dangerous ingredients it also contains a large number of carbohydrates (usually 60-90%). A dog doesn’t need carbohydrates – it is part of the reason why 68% of dogs in the UK are overweight. Dogs look unhealthy, suffer hair loss, seem hungry all the time and have bad breath and low energy. All these symptoms are directly related to bad feeding. The change to a raw diet seems more complicated than it actually is. Many people are worried about feeding the right amount of meat, bone, offal, and vegetable. But the reality is a lot easier than most people think. There are simple guidelines for creating a food plan and once put together it’s very easy to follow (there are many forums and pages online about this). Every dog is different. The amount of exercise, the size of the dog, and the level of activity all vary and so the menu plan needs to be tailored for each dog. Make a change and your dog’s health will prove to you that you made the right decision. 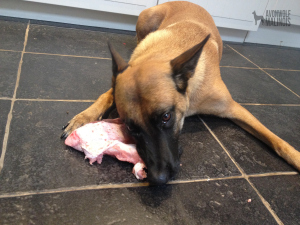 Written by Ursula Furter, from Avonwolf Malinois, for BreedingBusiness.com. Amazing, would love to know if I can get my dog on the barf diet using homemade food or if there are raw dog food manufacturer out there? Thanks. I recently switched over from homemade food to RAW Wild and its made a world of difference! My dogs have healthier teeth, shinier coats and more energy than I can handle! They are super healthy and very well priced! I’ve never had a problem with their food whatsoever.